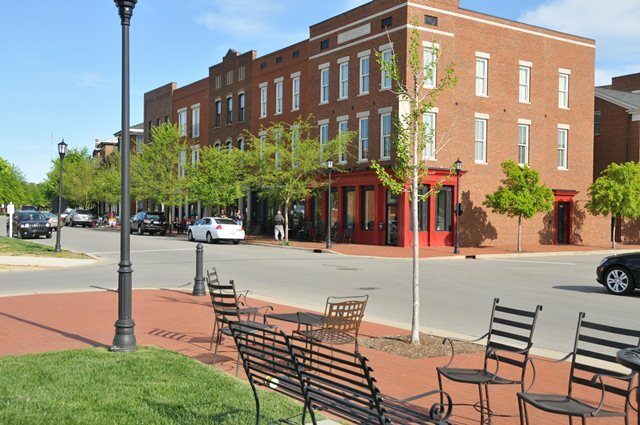 One of Louisville’s newest and most unique neighborhoods, Norton Commons, is a community that emphasizes convenience. More than a typical subdivision, Norton Commons, is the first project built under Jefferson County’s new “Planned Village Development” ordinance. Norton Commons encompasses 600 acres, 150 which of are parks, and includes countless amenities. Norton Commons is located North of I-71 just off the Gene Snyder Freeway (See Map Here). Most of the community is located in Jefferson County, although it extends partially into Oldham County. Norton Commons was built to promote community living. The smaller lots, grid patterned streets, side walks, and front porches where neighbors can enjoy each other’s company, promote the neighborhood orientation. Restaurants, schools, dog parks, playgrounds, pools, and various other amenities are all within walking distance from your home, there is no reason you would need you leave your neighborhood. This picture perfect “village” combines ease and tranquility to create the most relaxing place to call home. Norton Commons was established in 2004, so all construction is new. There is however a variety of styles when it comes to the homes, Foursquare Arts and Crafts, Italianate Cottage, Greek Revival, and Spice styles just to name a few. It is common for the homes in Norton Commons to be two stories, have clean lines and colors, and have front porches and rear garages. In 2011, the average price for a single family home in Norton Commons was $373,750 with an average per square foot of $184. Condos and twn homes are also available in Norton Commons. Condos in Norton Commons start out at about $137,000 and town homes start out at $295,000. The amenities in Norton Commons are vast. Retail and dining options are all within minutes from your front door. Retail stores include Eclectica Gallery, Something Blue, Ribbons and Rags, and Saratoga Design and Accessories. After you go shopping and work up an appetite, grab something to eat at one of Norton Commons’ restaurants which include Tea Station Chinese Bistro, Karem’s Grille and Pub, and Gelato Gilberto. Norton Commons is in the Jefferson County School District. Schools Close by Include Chancey Elementary, Kammerer Middle School, and Ballard High School. Louisville Homes Online features the best Norton Commons real estate MLS search for homes, condos and land available in the Norton Commons Neighborhood. We have worked hard to ensure this is the only site you will ever need. It is easy to use and navigate through Norton Commons real estate searches. The listings on our site are updated daily from the Louisville MLS. Additionally, you are able to get new property listings daily that meet your search criteria. We would be happy to answer any questions you have.